Ice creams are my favorite! There's no denying that ice cream is a popular treat. I myself would love to have a vanilla sundae whenever I get the chance. This is why my day just got made thanks to a quick recipe guide for ice cream. It only takes about five minutes which afterwards can lead you to an hour of sweet satisfaction. I know this because I've done this myself! The ingredients and materials needed according to the guide are a half cup of milk, one tablespoon of sugar, and a half teaspoon of vanilla extract. Of course tastes vary to every person so experimenting with the amount ratio of the ingredients is encouraged. If you don't like vanilla, go ahead and try your favorite flavors instead. Adding tidbits like nuts, choco bits, and rice crispies is great too! 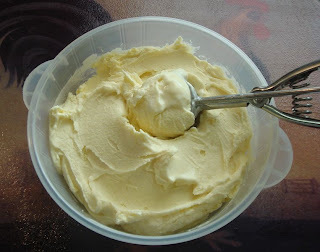 The materials needed to make the ice cream are two zipper bags (one considerably larger than the other), six tablespoons of salt, and lots of ice cubes. The salt lowers the temperature of the ice cubes to help thicken the mixture of ingredients. The more salt the better. However, make sure the salt will not come in contact with the ingredients or you will have a salty ice cream. With everything set up, the process is as easy as putting all ingredients in the small bag which is then completely sealed and placed into the larger bag along the ice cubes and salt. The whole thing then needs to be shaken for five to ten minutes or until the desired thickness is obtained. And you're done; happy eating! Instead of using a zipper bag for the ingredients, you can just use an empty ice cream container that can still fit inside the bigger container along the ice cubes during the freezing process. Just make sure to wipe of the sides of the container to remove excess salt.